TENDER Steak and Seafood at the Luxor offers a sophisticated setting where guests can lavish in fresh fish and quality beef. Open daily for dinner only, the appetizer selection features artisanal cheeses including a domestic assortment of cheddar, gouda, and goat cheese, alongside several soup and salad options. The main entrée section of the menu boasts all natural cuts of filet mignon, sirloins, and rib-eye amidst other specialty butcher cuts. Poultry and seafood options, including Hawaiian big-eye tuna, are available as alternatives, and the a la carte side dishes like risotto, potatoes, and vegetables help enhance any meal. To complement the dinner menu, TENDER Steak and Seafood offers an extensive, award winning wine list as well as top-notch service. Tender, located casino-level at the Luxor, is an anomaly in the dining culture of Las Vegas. 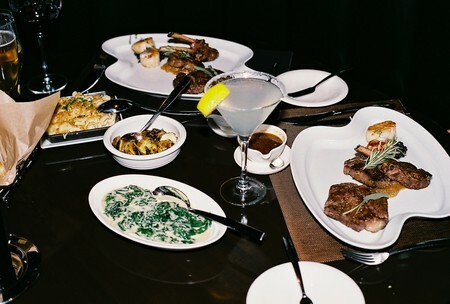 Tender is a venue that may be overlooked – it’s a steakhouse tucked inside a casino. 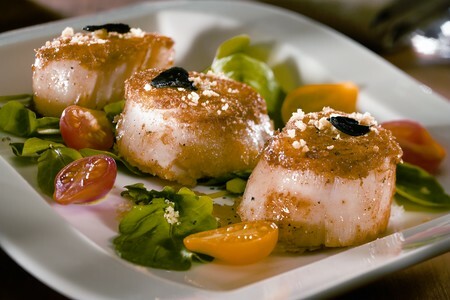 Tender is quiet and intimate, and offers steak and seafood, along with a wealth of redefined and amplified comfort foods. Tender’s attention to the food is not idle chat; the competent staff ensures that every dish and every ingredient is used at its peak, from the aroma to the appearance to the taste, with an eye on ‘the perfect bite.’ And that special bite may just be shared with a loved one -- Tender’s atmosphere is well suited for romantic dinners as much as for special occasions. Remodeled two years ago, Tender Steak and Seafood opened with the Luxor in 1993, and most of its staff began at its inception. The Chef de Cuisine for Tender is KC Fazel; he has worked with Tom Colicchio at Craftsteak, and has been with Tender four years. Raised in Northern California, Fazel attended the Culinary Institute of America for his formal training, and spent three years at Craftsteak; he also had a long stint with Brad Ogden at the renowned Greenbrier Resort in White Sulphur Springs, West Virginia. Approaching Tender Steak and Seafood, there’s a bar and seating facing the casino, adjacent to a podium with greeters in the front. The entrance is to the right. Entering the dining room, the setting is all about rich, gleaming hardwood floors, brass fittings, dark wood paneling, and simple, elegant artwork. The tables are accented with black leather and wood; it’s a warm, masculine, and very soothing room. Off of the dining room is their impressive wine cellar, an obvious source of pride. The wine cellar has its own corridor off the main dining room, and is a climate and humidity controlled environment. The wine list may be daunting to the uninitiated. White and red varietals are designated as domestic or international; and the list of domestic reds has over 100 selections alone. The reds are the most complementary to Tender’s selection of red meats and game. I enjoy a 2004 Luna Merlot with my dinner. It is robust, and a nice accompaniment to the lamb and bison. Diners should not be intimidated by the wine list; the staff is trained to guide their guests with wine pairings, and it adds another dimension to the meal. Tender also holds an Award of Excellence from Wine Spectator. Tender is relaxed but sophisticated. Not trying too hard, the atmosphere is quietly confident and exquisitely tasteful. The table settings are simple. Each table is set with a candle, glassware, and rattan placemats with linen napkins. The food is all presented on stark white, square and rectangular serving platters. We’re dining at Tender on a Monday evening with an early reservation. Tender’s food is more than just well prepared; it is an experience. The other ‘gems’ of Tender are its servers. Ours, Joe and Dewey, have been with Tender for all of its seventeen years, and their pride in Tender is evident. A restaurant is only as good as its weakest link; Joe and Dewey firmly put Tender in its best possible light. It IS very quiet when we arrive, but fills much later. Typical of many local restaurants, Tender sees a seasonal ebb and flow, and business picks up late summer-autumn. Chef Fazel has already decided what items will be served, and our dinner begins with the basket of bread. Made on site, the sourdough and multi-seeded breads are served with Vermont butter. This is a great example of the care that goes into every menu item. The sourdough bread has pieces of feta cheese baked into it – it’s incredibly rich and savory, with tremendous depth of flavor. The feta speaks as clearly to my nose as it does to my mouth. We begin our meal with three appetizers and a salad: the Hawaiian Big-Eye Tuna, Shrimp, and Escargot Rockefeller, as well as the Heirloom Tomatoes with Buffalo Mozzarella Salad (a daily special not found on the regular menu). The tuna is served as a trio. Two treatments are raw -- one is diced over seaweed and the other is sliced in strips, served in a sweet and sour sauce -- and there’s also a seared portion with three slices of tuna. The seared tuna is lovely and served with crisp wonton chips and a spicy soy chili sauce. The Heirloom Tomatoes and Buffalo Mozzarella Salad is a culinary epiphany. The tomatoes (and all produce) come from a farmers market in the Sonoma Valley, and the buffalo mozzarella is imported. This simple preparation has ruined me for all future produce that doesn’t exhibit the same quality. Buffalo mozzarella is unlike any processed cheese we have in America. It is creamy and decadent with body, and a tangy, rich flavor. The Shrimp is served two ways: Chilled and as Sautéed Hawaiian Prawns. The presentation is striking; on a white plate, two large chilled shrimp are served with seaweed salad on a bed of ice. The two sautéed prawns are on a black plate, and between them are three dipping sauces: mango salsa, pesto sauce, and a simple cocktail sauce. The two shrimp preparations are very different. The chilled shrimp is intensely sweet and the sautéed shrimp is salty and savory. The dipping sauces add another facet of flavor to the shrimp. The Escargot Rockefeller is a first for me. The name “Rockefeller” (often associated with oysters and escargot) means that the seafood is baked and served on or under sautéed spinach. Rich, buttery, and redolent of the tomato-basil cream sauce; escargot have the same profile as mushrooms, in that they retain the flavor of what they’re cooked in. Served in four small square ramekins, with toast points, the savory escargot and spinach spreads easily on the toast, and is delicious. Our entrees arrive; I am full, but determined to try these beautiful dishes that smell so intoxicating. We have classic Surf & Turf, as well as Free Range Oregon Lamb. Our plates are beautiful, and yet so simple. The Surf & Turf is a bison ribeye garnished with a sage leaf, as well as two beautifully seared scallops. They’re served on black beluga lentils, and are topped with a sprig of thyme and jalapeno crème fraiche. Last but not least, there are two cuts of lamb – a lamb chop rack and a lamb loin porterhouse situated on an apricot chutney, and topped with rosemary. On the side is Tender’s homemade steak sauce and mushroom sauce. This is an unfairly intoxicating dish. I’m so excited for the bison, but all I can smell is the aroma of the lamb, and it’s cooked beautifully. The lamb is soft, and with the apricot chutney, lusciously sweet, succulent, and smoky in flavor. This is not to say the scallops are less than well-executed. They’re seared and still slightly opaque in the center. The crème fraiche is also mild, but flavorful. The lentils are a delightful surprise: a little chewy and full of earthy flavor. As if we could try another bite, side dishes are set on our table. Baked Macaroni and Cheese, Creamed Organic Spinach, and Pan-Seared Artichokes are all cooked until steamy hot. These are so comforting, but executed on such a level that calling them steakhouse side dishes doesn’t seem fair given how sophisticated, fresh, and well-prepared the dishes are. The Macaroni and Cheese includes smoked bacon, panko bread crumbs, and white cheddar. I love macaroni and cheese, and can’t stay out of this creamy, salty, cheesy, crunchy treat. Tender’s Creamed Spinach is a welcome departure from the spinach we were served in elementary school. This is creamy and rich. The organic spinach is sautéed with garlic, and then folded into a homemade parmesan cream sauce. The resulting dish tastes savory, and feels velvety in my mouth. The spinach tastes as though it was growing in a field not so very long ago. The Pan-Seared Artichokes is a simple dish of seared artichokes. They’re tender, with clean flavors. Seared in butter and lightly seasoned, these artichokes speak to the yearning for fresh, well cooked produce. 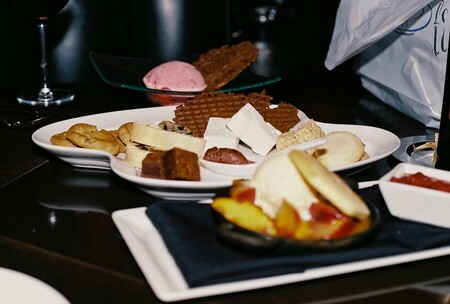 We complete our meal with desserts. Tender’s desserts are included on the drink menu. We try three: The first is the fresh homemade Cookie and Treat Platter, which features cookies, brownies, homemade marshmallows, and their own ‘date newtons.’ These treats are sweet, and the ideal companions to their thick, robust espresso. The second dessert is the Peach Gelato and Raspberry Sorbet; they are fresh, crisp, and tickle the palate. The peach gelato is served with thinly sliced fresh peach wedges. The sorbet has an artistic waffle garnishing it. Desserts made from seasonal fresh fruit are exponentially better than artificially flavored ones – fresh makes all the difference. Our final dessert is a Trio of Cheeses. Served on a slate wedge, this course is a beautiful study in contrasts. With three sharp cheeses (blue, camembert, and wine-soaked cheddar), honey, breads, and fruits, the plate presents the sharp, and sweet, and fruity. I think Europeans are on to something; cheese as a dessert course works remarkably well. Pungent blue cheese, served with sweet honeycomb, provides a taste that I never would have been bold enough to try had it not been served to me. I’m glad I had the opportunity – it is sweet, tangy, and a unique marriage of flavors. The power of Tender Steak and Seafood lies in their unwavering commitment to quality ingredients, conscientious preparation, and to treating ingredients with respect. Chef Fazel personally tours the facilities where they purchase their product: Anderson Ranch in Oregon (for lamb), a Wyoming ranch (for bison), as well as the Texas ranch that raises their wild game. Their basil-fed escargot comes from another facility in Oregon, and produce comes from the Sonoma Valley. These standards are uncompromising and the food reflects that care. Tender is a unique restaurant unlike many here in the Las Vegas landscape. Do not miss this jewel – it’s a special occasion treat. Main Dining Room | Bar 4:30 p.m. - 11:45 p.m.
How fresh is the seafood that you serve? TENDER's fresh seafood is flown in daily from Hawaii, California, New York and Alaska. My wife and i make it mandatory to eat here everytime we are in Vegas. The food is brilliant and the service is very attentive and gracious. I went to Tender with several colleagues while in Las Vegas for a conference. The food was good - somewhat standard steakhouse fare but great for a group with diverse tastes. Service was really nice. The waitstaff were very accommodating, and although it took awhile to order, delivery of the meal was quite prompt. The best part of the experience is that our table was tucked away in a corner of the restaurant, and we were seated at a round table, so we were all able to interact together - away from the noise of the casino. i was eager to try this place, as i was staying in the hotel but from the beginning, it wasn't good, the barman asked me if i wanted a menu then he said he didn't bring it because i said i didn't want it which was untrue, also, they seated me at the bar despite the fact i had a reservation then moved me into a booth section with a "John," who apparently likes to talk more than he likes to serve, why check on food when you can constantly upsell drinks? It took so long I asked for the bill, then left before food was ready. Still charged me $85 for soup, not exactly tender and if you think it isn't fair i'm making this public, i told staff at desk and they did absolutely nothing. Great restaurant if you like cold and over seasoned food. My wife described her barramundi fillet as fish soup. When my husband and I drop $200 on a meal (bottle of wine, shared appetizer and two entrees), I expect to be "wowed". This was certainly not the case when we recently dined at TENDER. My steak was cooked and seasoned exceptionally well, however the same could not be said for my husband's; it had almost no flavor whatsoever. The lyonnaise potato gratin was an oily joke and the asparagus left much to be desired. The soup tasting trio was pretty good, but still, not amazing. The ambiance is very nice, although the music was a little too loud, which made everyone in the restaurant have to speak louder. The service was exceptional, but aside from that, we were not impressed at all. We won't be returning.